Control Joints. Proper design of all structures requires recognition of expansion, contraction, and building movement. 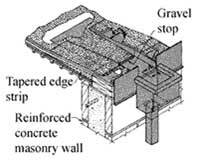 In concrete masonry structures control joints are used to reduce cracking from these movements. 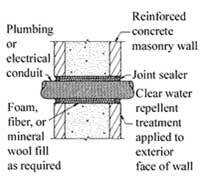 Reinforcing required in seismic areas permit wider spacing of expansion and control joints in concrete masonry. A control joint is recommended where an interior masonry wall intersects an exterior masonry wall unless the walls are designed to support each other. Control joints are also recommended: at large openings in concrete masonry walls; where there are major changes in concrete masonry wall heights; at changes in wall thickness; where there are control joints in foundations, floors, and roof construction; and in long runs of walls. Where continuous horizontal steel reinforcing is required to extend through a control joint, sleeves can be placed over the reinforcing to allow the joints to move as designed. 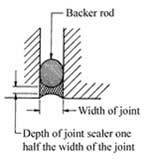 Nonstructural reinforcing may be cut at the control joints to allow less restricted movement at the joint (see Figure 5). Additional vertical bars on each side of all control joints. Terminate all non-structural reinforcing 2" from control joints. Provide 4'-0" long smooth dowels across the joint. Prevent bond between bar and grout with grease or a plastic sleeve. Cap all dowels to allow 1" of movement. Penetrations. Openings throughout concrete masonry walls for scuppers, drains, plumbing, and electrical conduits must be properly flashed and sealed so that the wall can effectively resist moisture penetration. Proper installation of joint sealers around pipes and conduits is especially important since the sealer often serves as not only a moisture barrier but also a flame barrier.